Tinolang Manok sa Ampalaya is an Ilokano version of chicken in ginger soup with ampalaya or bitter gourd. Ilokano loves vegetables and including the bitter gourd (parya in Ilokano dialect) the vegetable is usually added from the famous Ilokano vegetable dish pinakbet to guinisang mongo and other dishes including tinola. Ilokano uses ampalaya instead of the usual papaya or sayote which makes the soup of the dish taste bitter. Ilocano who for some reason love bitter dishes one such famous dish is the papaitan. There is one similar soup dish where sotanghon noodles is also added to the tinolang manok. If the ampalaya fruit is not available the leaves and tendrils is also used, click here to see that post. Cooking method is similar to tinolang manok with papaya or tinolang manok with sayote. I could not find chili leaves so I substituted it with baby spinach I just used extra green chili to compensate for the supposed chili aroma from chili leaves. 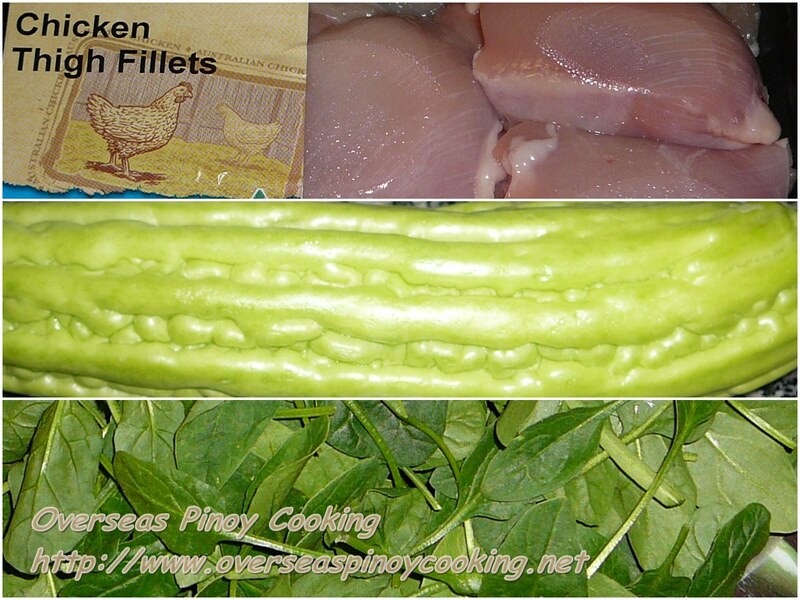 Here is the recipe of tinolang manok with ampalaya, enjoy. In a big sauce pan sauté garlic and onion until fragrant. Add in the chicken and continue to stir fry for 3 to 4 minutes. Add in the fish sauce and stir cook for another 2 to 3 minutes. Now add in water up to about 1 inch above the chicken and peppercorn bring to a boil and simmer for 8 to 10 minutes or the chicken are tender, add in the bitter gourd and green chili and simmer for another 3 to 5 minutes or until the vegetable is just cooked. Correct saltines if required, add in the spinach and cook for another minute. Serve immediately.